Here is a take on stuffed peppers that is a little different. 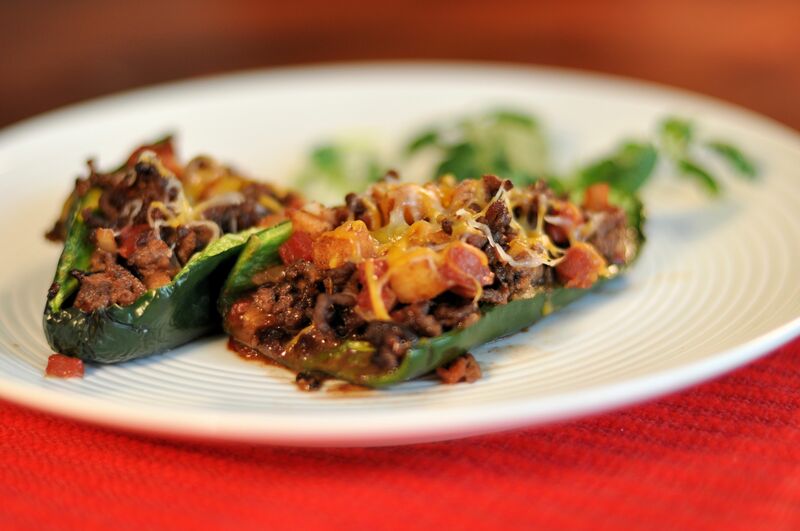 If you want a milder dish, then substitute bell peppers for the poblanos. Heat oil in a skillet over medium-high heat. Brown ground beef in oil until no longer pink. Add onion and garlic. Cook until soft. Add apple, raisins, cinnamon, and beef broth. Simmer until liquid is absorbed. Arrange the peppers, cut side up, in a baking dish. Fill peppers with ground beef mixture. Bake at 400 degrees for 20 minutes or until the peppers are tender. Top each pepper with1 tablespoons of cheese and continue to bake until the cheese is melted. Posted on February 27, 2015 March 11, 2015 by Twain FarePosted in Cooking for TwoTagged cooking for two, frugal living, stuffed peppers.